← Rants from an Idol Addict – We Are Going to the Movies! Rants from an Idol Addict: Thank You Voters! Well I’m a happy little duck over here! Paul is gone, gone, gone, gone. And my Stefano is safe. I’m sure I’m one of Stefano’s few fans. I promised earlier today that I’d start voting for him if he makes through, so I’m flexing my fingers now. 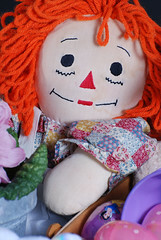 Oh Rihanna, thy new name is Raggedy Ann. Funny to have star “singers” show up to perform who are worse than the contestants. Well, worse that all except Paul. Good job Kelly Clarkson. I wasn’t a fan during Season One (my votes went to Tamyra Gray). She won me over a little tonight with the duet even though it was country ditty. That’s impressive. Speaking of duets and group numbers, we get a repeat of that from the contestants this week. The Lauren and Scotty country duet pairing is going to get old real quick. I liked the guy quartet doing the medley of Simon and Garfunkel songs, though I note that Paul and Jacob are not as skilled at blending in. Haley further attempted to class-up her limited clothing ensemble. I will give her points for wearing items that are figure flattering. Which brings me to poor Lauren. The stylists must be hazing her. They dressed her in a bright yellow outfit that bloused around her adding a false sense of weight. This entry was posted in Thoughts on Life and tagged American Idol, entertainment, music, Rihanna, Season 10, television. Bookmark the permalink.